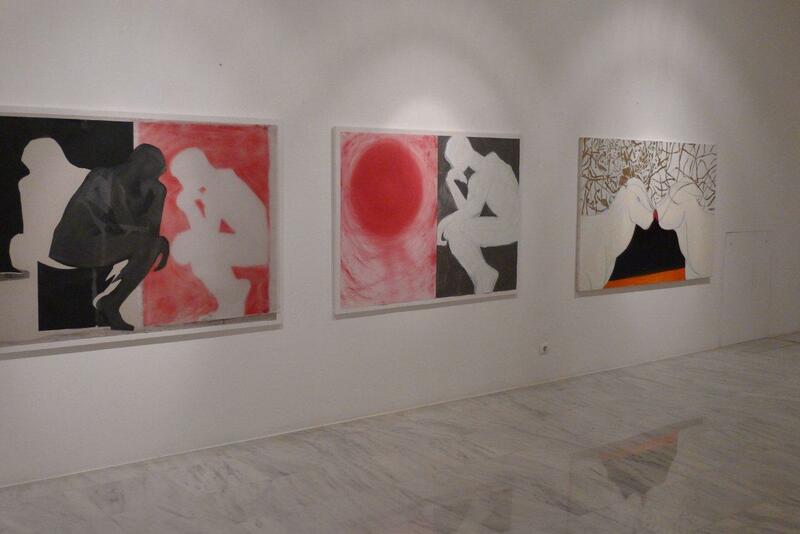 On Thursday, January 26 at 8.00 in the evening Maria Demetriades opens the exhibition The Thinker The Touch with the latest work of Eleni Zouni. Six years ago the painter embarked on a research project with drawings-references to paintings from the past, where the momentary Touch seems to be the code for interpreting the image. She uses various materials to paint and convey into contemporary reality the notion of Touch and Engagement with what surrounds us; with what is taking place now. 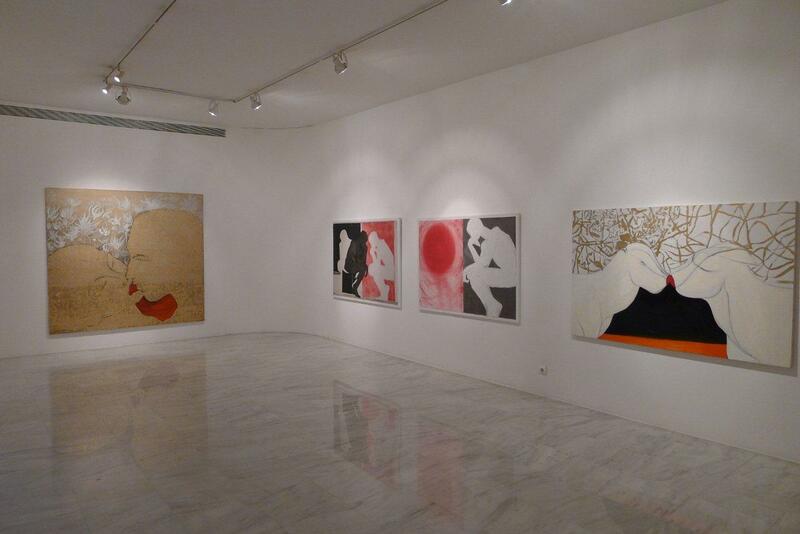 Her works are identical circular journeys of situations and emotions through Time. Eleni Zouni studied graphic design at the Vakalo School and painting at the Athens School of Fine Arts, under D Kokkinidis. Between 1984 and 1994 she lived in Barcelona and Amsterdam. In 2009 she received a postgraduate degree in Graphic Design & Visual Communication from Derby University –Vakalo College of Art and Design. She has participated in numerous group exhibitions in Greece and abroad. Εγκαινιάστηκε την περασμένη Πέμπτη, στη Μέδουσα, η έκθεση με τη νέα δουλειά της Ελένης Ζούνη. Πρόκειται για δυο ενότητες φαινομενικά χωριστές, αλλά ουσιαστικά αλληλένδετα δεμένες, καθώς το άγγιγμα πυροδοτεί αναπόφευκτα το στοχασμό για την ίδια την πράξη και ο στοχασμός με τη σειρά του ανατροφοδοτεί την ανάγκη για το άγγιγμα. Ο σκεπτόμενος έλκει την καταγωγή του από το γλυπτό του Rodin, μια μορφή βαθιά χαραγμένη στη συλλογική μας μνήμη, ερμητικό σύμβολο της δύναμης του ανθρώπου να στοχάζεται πάνω στην αδυναμία του να πραγματώσει όσα επιθυμεί. Η Ζούνη ξεκινά από αυτή την αφετηρία και προχωρά στην εξελικτική μεταμόρφωση του σκεπτόμενου. Ακυρώνει την υλική του υπόσταση και μέσα από τη ζωγραφική πράξη τον μετουσιώνει σε ένα εικαστικό πεδίο πάνω στο οποίο προβάλλονται οι αντιληπτικές διεργασίες της ίδιας της έννοιας του στοχασμού. Η Ζούνη χειρίζεται με εξαιρετικά επιδέξιο τρόπο τη σύγχρονη εκδοχή του παλαιού αιτήματος της τέχνης ανάμεσα στη vita activa και τη vita contemplativa, την πράξη και το στοχασμό. Τα έργα της προσφέρουν και σε μας τη δυνατότητα να μετέχουμε σε αυτό το αίτημα, να νοιώσουμε και να στοχαστούμε, να αφεθούμε κι εμείς στο αμφίσημο πέλαγος που εκτείνεται από την ευφορία της πραγμάτωσης μέχρι την οδύνη της απώλειας. Η δύναμη των έργων βρίσκεται στην ίδια τη σχέση τους με το θέμα της ενότητας: η συνεχώς ανατροφοδοτούμενη σχέση ανάμεσα στη στοχαστική διεργασία και τη ζωγραφική πράξη, στο άγγιγμα και τον σκεπτόμενο. ω Two different groups of works are included in the latest visual production by Eleni Zouni. 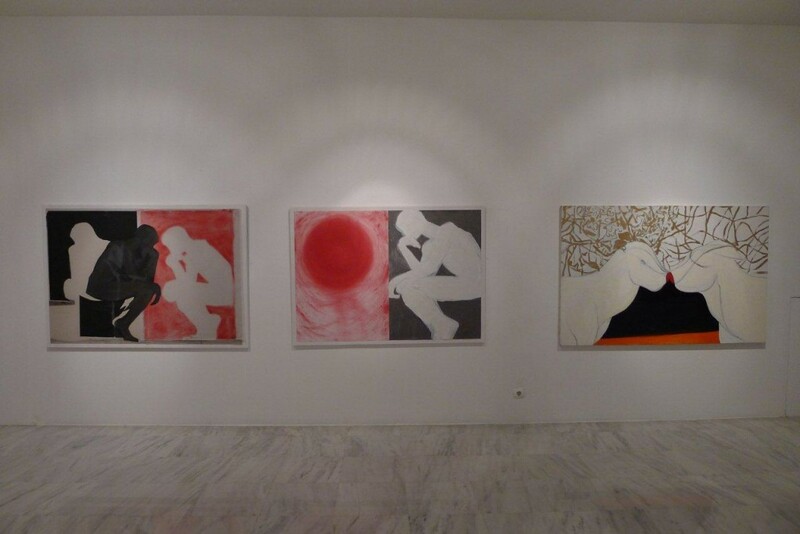 The title of her exhibition, The thinker	the touch, already makes an allusion to this duality. The first group involves large-scale works, depicting people, animals, or people and animals together in a paradoxical and unexpected union. The second group owes its origin, its base, its inspiration to The Thinker, Auguste Rodin’s famous sculpture. The hermetic, the mysterious and the ambiguous that permeate her compositions are suggested by the title itself. The thinker on one hand, and the touch on the other? The thinker while pondering the touch? The thinker that touches his face while visualizing strange pairs in various meetings? 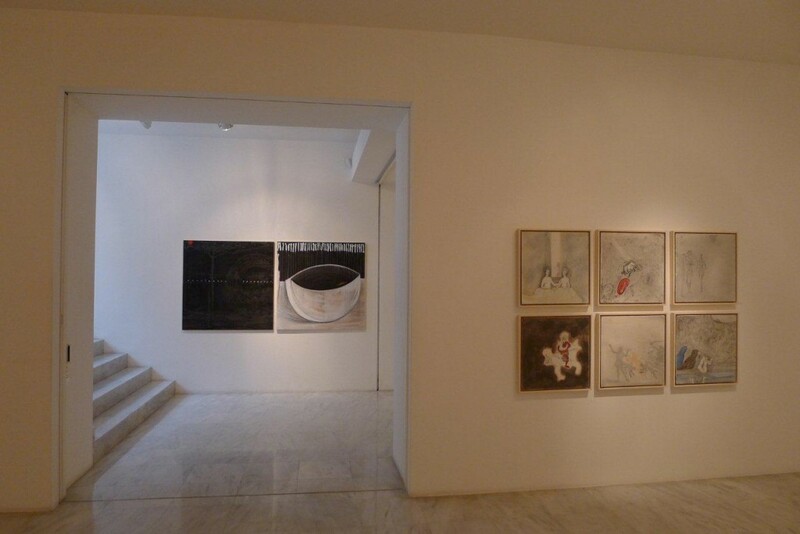 The simultaneous presentation of two distinct, iconographically speaking, entities is typical of Eleni Zouni’s earlier exhibitions and presentations. In 2001, during her solo exhibition at the Medusa Gallery, Eleni Zouni presented a group of works carrying her individual visual signature simultaneously with a group of portraits of children from African, Asian or Latin American countries. 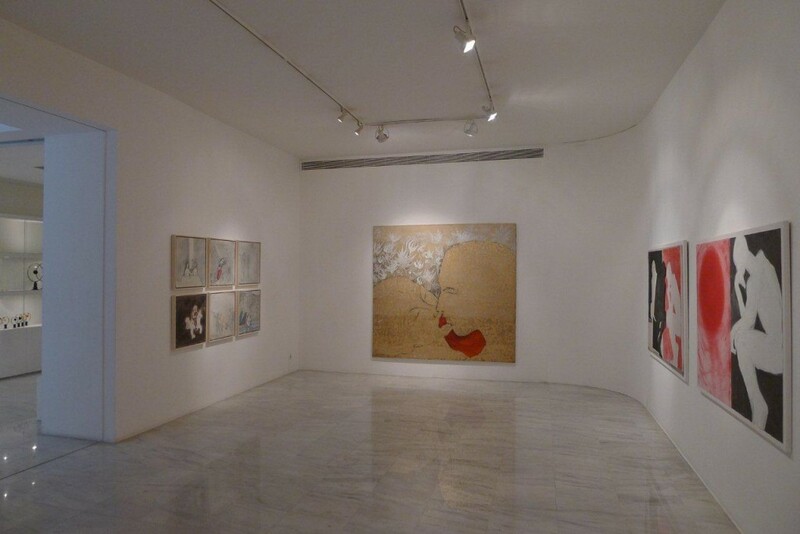 In 2004, again at her solo exhibition titled Wonderful People, at the same gallery, one could observe a presentation running in parallel; that is, the evolution of her personal art on one hand, and a second group with altered portraits of celebrities from the media, featuring digitally processed photographs, on the other. In the past, her second group of works was essentially an exercise of her preoccupation with the globalized contemporary reality. 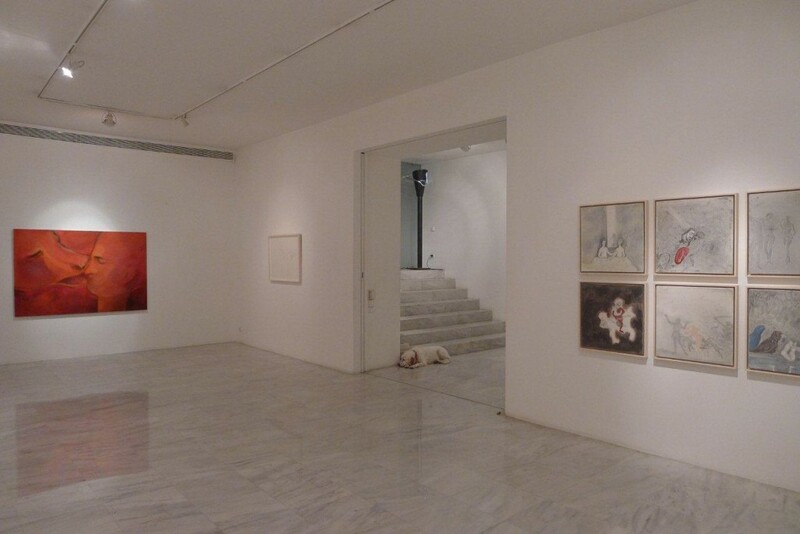 In the current exhibition, of 2012, the second group appears as a rest, including experimentations on forms and landmark, influential works from the history of art, mostly those of Rodin, but also Van Eyck, Rembrandt, Gustave Moreau and others. It is possible that through those exercises, Eleni Zouni seeks to take a brief pause from the constant, painful introspection, the inner processes for a crystallized image of an inner reality. A reality rendered in her art by her personal morphological codes and her particular visual alphabet, through the spiritual alertness and emotional arousal of the painter’s psychological world. The works concerning touch, so suggestive, so unintelligible, so hermetic, exude a calmness and a finesse fraught with emotion, literally through the minimal. 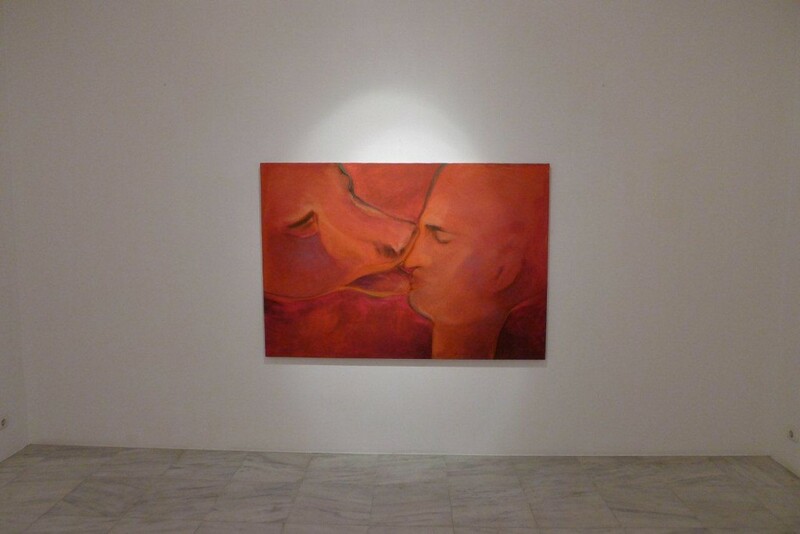 In the Kissing Couple, the background, consisting of patterns from her previous works, like a golden tapisserie, executed with bronze powder, overflows the even surfaces of the figures. The posture, the meeting of the lips, are all rendered with calm and simplicity. A red spot, between the two figures, like a lake, like a blot, spreads to define the two human entities, like a mapping extending from the outer to the inner dimension. The outlines and the hints of rendering the figures’ characteristics are at the same time the minimum and the essential. In the work titled Dog with man, the touch conveys more intensity, maybe also pain, while the execution in red and the drawing with elements and lines of coal lends more materiality, depth and tangibility to the composition. The two White Kissing Animals – they might as well be deers, unicorns, dogs – restore the sense of calmness, whereas drawing-wise they are rendered with minimal lines. The interesting part of the composition focuses on the background contrast with lines made of bronze powder in the upper part and the deep black at the bottom. In the works concerning the second group, The Thinker, and especially the two-fold ones, duality re-emerges even more prominent, both in iconography and plasticity. Through various techniques, on wood, in pencil and color, on canvas in acrylic color, iconography powder pigments, cardboard, photographic paper, manually applied painting powder, develops the form of the seated man. The Thinker, in white background, with dark blue strokes, scattered black letters, black stripes, in various versions showing frontally or in profile view the seated thinker with his leaning hand. Why did the painter choose the famous work of art? Perhaps she was attracted by the form of the figure itself. But it is possible that she decided to paint it because it responded to her conceptual pursuits as far content was concerned; this is because the seated man is sufficiently immersed in his existential vortex and serves the artist as a model in her own developments. As far as the two-fold works are concerned, the second part reproduces an unexpected intensity with the expressionistic, explosive forms of a confused world. 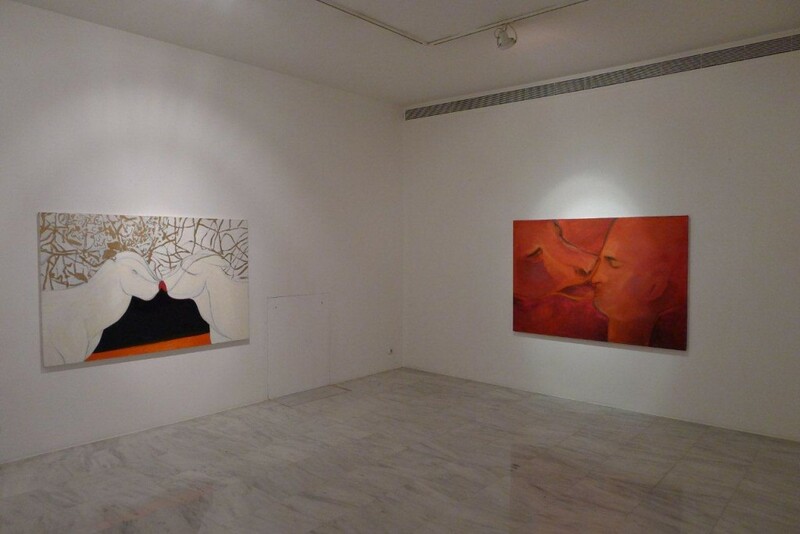 The symbolic, minimal schematization of forms, lines, blots, prints, concerning the compositions in general, and the background in particular, or the figures, is a decisive condition in Eleni Zouni’s painting and perhaps one of the most attractive elements in the evolutionary journey of her art. “With Kokkinidis, I had started to deconstruct the notion of man and worked on the shape of the pod” says the artist about her teacher and the time she was a student at the ASFA. To this day the debunking of man has resulted in an intellectual schematization, with figures, sometimes appearing like small humans in arrangement and sometimes turning into short consecutive lines, or changing into lines that run and melt downwards. These are patterns of a schematization with origin equivalences and cause in primitive art, of an anticipation of achievement through schematized depiction. The compositions of Eleni Zouni have their origins in mental processing; they are however surrounded by her strong intuition, where her very body participates in creation itself, as for example in the act of cycle designing. Such compositions, although often hermetic and unintelligible to the spectator, to the artist herself, have all their components and every detail of the whole checked and controlled. The part and the whole, the microcosm and the macrocosm of her representations, with the artist’s familiar techniques and methods, her special aesthetics, eventually end up in this attractive, schematized, hermetic symbolism imparting, through the minimal, the entire spiritual and psychological context of her inner reality.